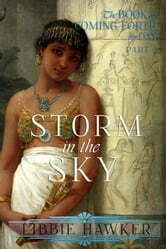 Libbie Hawker’s saga of Amarna-era Egypt, The Book of Coming Forth by Day, continues in Part 2: Storm in the Sky. By sheer force of the Pharaoh’s will, the City of the Sun rises from hot, barren sands. But as this monument to his strength flourishes, the king’s ties to sanity begin to fray. His religious zeal and unchecked power lead him to commit one atrocity after another, and soon those who dwell in the throne’s shadows must enter into a fatal conspiracy to prevent Egypt from crumbling altogether. Nefertiti believes she has found a way to repay her father for his many wrongdoings. But her vengeance will cost what she holds most dear. Tiy, cast off from the court but still grappling for power, re-emerges to face the Pharaoh with a weapon unlike any he has encountered before. The burden of the throne’s security falls on young Baketaten—but she is not as fragile as she seems, and she will play a deadly game of deception to obtain what Egypt needs most: an heir to the throne. And Horemheb, tormented by love for a woman he can never have, will risk his own damnation when he swears to avenge an unimaginable loss.